468 Vista Verde Rd is located in the popular area of Mustang Mesa, approximately 10 miles north of Bishops on Hwy 395. This home has a NEW PRICE! Don’t miss out on this great property! 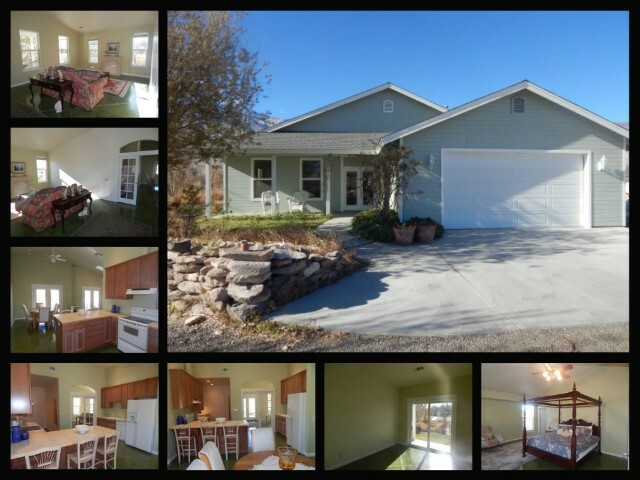 This beautiful, 3 bedroom, 2 bathroom homes is located on the 395 corridor to Mammoth Lakes! Expansive views from all windows you will love this bright and airy home. Vaulted ceilings, recessed lighting, ceiling fans and French doors, light is all around. The floors are stained concrete and the master bedroom is spacious with a bay window. Wonderful, tucked away location. This home has stunning views of the mountains and Round Valley, with easy access year round. Trees located around the property and low maintenance yards and room for garden areas. The Mustang Mesa neighborhood is north on Highway 395 between 9 and 17 miles from Bishop, with great views of the majestic Sierra Nevada. The properties in this area draw equestrian lovers and outdoor enthusiasts. The lots in this area range from .5 acre to slightly over 1 acre with the homes ranging in size of 1,200 to 3,000 square feet. Each property is serviced by individual wells and private septic systems.